Balancing on a fit ball is a lot harder than it looks, let me tell ya. Engage your core! I’m like everyone else in making New Year / new body resolutions after the holiday feasting frenzy. I even like to get a head start on my list in December, setting goals to join a gym, do a fitness boot camp, join a zumba class, get a trainer, blah, blah, blah. Well next thing you know, calendar pages fly off into the air like a 1950’s movie, it’s June, and I haven’t done any of those things. Not one. Nope. Nada. I’m not fat but I confess, I ate too many cakes at Christmas and I didn’t care (not at the time. I do now that they’re parked on my thighs). They were yummy and holidays are meant to be joyful. What’s more joyful than eating cake? I was under massive family stress, and cake made me feel better! I told myself I’d work if off later. And then I was shocked and horrified when my jeans and dresses didn’t fit; I even broke a zipper on a pair of shorts and split another pair of shorts when I squatted too fast to hug my dog. My darling dog didn’t care but I was appalled. I told myself it’s time for that fitness boot camp that I keep talking about and keep procrastinating. I decided to go to Kamalaya Koh Samui for my fitness retreat. I knew they had recently built a big new gym and great big lap pool on top of a hill with sweeping views of the sea, with fitness programs to add to their abundant offerings of detox, spa, weight loss and yoga retreats. I hadn’t been to Kamalaya in a few years and was excited to see the new facilities and programs and reboot my body. I’d planned to go with a friend, but my friend backed out and suddenly I felt deflated and depressed. Without a buddy to go with, how was I going to do it alone? Suddenly it seemed frightening and daunting. I had originally planned to go as soon as I could, but I found myself putting it off and trying to avoid thinking about it. I had plenty of excuses to put it off too – friends visiting town, dogs need vet appointments, umm…I need to reorganize my sock drawer, whatever. In flash of extreme cowardice, I even thought about cancelling. Jeez. What was wrong with me? How had I become such a spineless pudding? (It must be the effects of chronic stress). I eventually pulled myself together, booked the plane tickets and was on my way. Once I actually got myself to book the thing, I suddenly felt a lot better, like a heavy load had been lifted, and started looking forward to it again. Kamalaya offers two types of fitness programs, the Basic Optimal Fitness Program and the more advanced Comprehensive Optimal Fitness Program. Both are personalized to the guest’s needs. When I told Linda, my contact at Kamalaya, that I wanted to do the Comprehensive Optimal Fitness retreat and get myself into shape after pigging out and letting myself go over the holidays, she suggested we talk on the phone. I told her that I’d always wanted to do a fitness boot camp and come back like a new person with a new body. 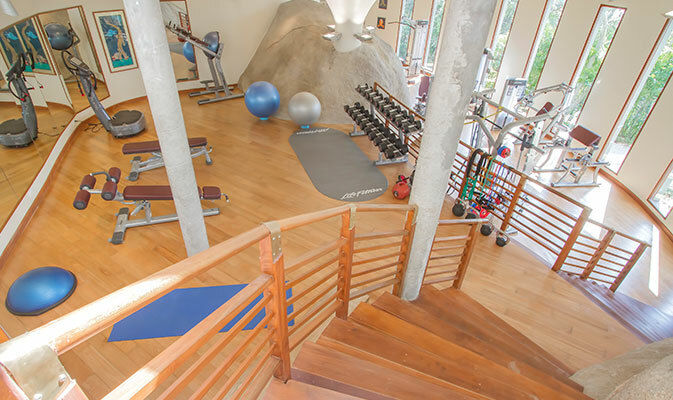 Linda told me the Comprehensive Fitness retreats were very intense and designed for people who were in a regular training and workout program in their real life. She asked if I had a regular workout program during the week. “Ummmm. (uneasy silence). No…?” I answered nervously. “Oh yes,” I said, slightly relieved. “I used to do yoga every morning, but err, this year I slacked off. So umm … actually, I guess, well, … no?” (This didn’t sound good. I felt anxious again). “But I want to do this to get myself back on track, and get into a habit and develop a routine that I can maintain and get into good habits again” I blabbered excitedly. Linda gently suggested that the Basic Fitness program would be more suitable for me as it wasn’t so intense and would give me time to enjoy the other offerings at Kamalaya like the complimentary daily yoga and Tai Chi classes, spa sessions, and just relaxing and enjoying the pool and beach. The Kamalaya experience, she explained, is about finding your balance, not a fitness boot camp experience where you kill yourself. It shouldn’t be so extreme. Oh. Okay. I guess I’d been watching too many reality TV shows like The Biggest Loser and thought that that’s what you have to do to yourself to get results. So a couple of weeks later, I arrived at Kamalaya at the lovely island of Koh Samui, one of my favourite islands in Thailand. I‘ve always liked the laid back bohemian vibe here. My first day at Kamalaya started with an evening massage in the spa. I arrived at Kamalaya completely exhausted, feeling like total crap. The first order of business for every guest upon arriving at Kamalaya is the personal body analysis and wellness consultation with a naturopath. The naturopath Deidre told me I looked utterly exhausted and after talking about my life she gave me suggestions on what I should be eating and additional therapies that might help me during my stay, such as a life mentor session to help me reorganize my life so that it would be less stressful. However I wasn’t in the mood for a life mentor and just wanted to work on my physical fitness and bring up my energy level, and get lots of rest, including mental and emotional rest. The stunning view from the spa showers. My fitness program was for 7 nights / 8 days. It sounds long, but it isn’t really. Two days are allocated for travel; the first day is for the fitness assessment, so there are actually only 5 days of actual fitness training sessions. This gave me plenty of time to wind down and relax before my first training session, which I still dreaded. I was so unbelievably tired, bloated, and my sinuses were getting congested, so I could barely breathe. As it turned out, there was nothing to fear or dread at all. I’d pictured myself in a montage of frenzied workouts like cycling, running on the treadmill, Stairmaster, weight training, burpees, crunches, and all those horrible things you see on reality TV weight loss shows where the contestants are crying and falling off the machines with their legs flailing in the air. It was nothing like that. The assessment had shown that I was very, very, weak, hadn’t been doing regular exercise for a while and had low energy. These were the effects of chronic stress. My personal training sessions started with a warm up on the bikes every morning. Also, like many Asians, I am double jointed, which makes me unusually flexible. I thought being flexible was good, since it was easy for me to do yoga, but the trainers told me that it’s dangerous and potentially bad for my joints if I didn’t exercise in ways to protect my joints. So my sessions were designed to focus on core strengthening and exercises that didn’t put stress on my knees (no lunges for me). My trainer Frank, an enthusiastic young Thai man, was a fountain of information. I’d had personal sessions at other places where the trainer told me to do 15 reps of this and that and then counted mindlessly while staring into the distance. This was nothing like that. Frank was constantly engaged with me, explaining every move. His first task was to train me how to breathe using my core and my tongue while exercising. The exercises focused on using body weight, core strengthening, proper breathing. We used TRX, bands, fit balls, with everything focused on breathing and core strengthening. The lovely locker room at the gym and lap pool. It was fun and I learned so many new things through Frank’s instruction. I found the breathing and core coordination really relaxing, since it involved mental concentration which relaxed my mind, sort of like meditation. The rest of the week’s training was pleasant and not strenuous at all. I took notes in my Kamalaya note book and on the last day I made videos of Frank demonstrating an easy fitness routine that I could do at home. I made sure my gym sessions were around 10 a.m. so that I could wake up late, have breakfast around 9 and then spend the morning in the gym, followed by detoxifying Far Infra-Red sauna in the spa. The plunge pool and rest area outside the sauna and steam rooms. I fell asleep here after a Far Infra-Red Sauna one day. My fitness program included detoxifying Far-Infrared Sauna and various types of massages in the spa. I was also free to use the spa facilities such as steam cave and plunge pools, and I could add any additional spa offerings such as reiki, Chinese Traditional Medicine, acupuncture, life coaching, and many more, at additional cost. Wellness talks, lectures and workshops are open to all guests. All the guests are able to attend a full range of free daily wellness classes and activities, such as yoga, Tai Chi, meditation, aqua aerobics, chanting meditation, talks on stress management, mindfulness and more. There’s so much to explore here! On boiling hot days I preferred the cool comfort of the air-conditioned massage rooms. There’s a rotating roster of visiting holistic practitioners specializing in energy healing, emotional healing, crystal therapy, hypnotherapy, flower essence therapy, and all types of alternative therapies. The resort also offers sightseeing activities such as an island tour, temple tour, boat trip, and a daily shuttle to into town. Some guests went on this half day boat trip around the surrounding small islands. How gorgeous! There was no shortage of things to do. In fact like most guests I had to keep looking at my program schedule and decide what classes I wanted to do and how to fit them in, but you could be as busy or relaxed as you wanted to be. This was the place to focus on yourself and do whatever you feel you want or need at the time. I normally enjoy yoga, but unusually for me, this time I didn’t feel like doing any yoga or anything more than my fitness sessions and meditation classes, and catching up on the much needed sleep that I wasn’t getting at home. One of the highlights of my stay was my big, wonderful pool suite, conveniently located in a new block of suites next to the hilltop gym and lap pool. My pool suite included an indoor living room with wraparound sofa, and an outdoor living room with sofa, dining table and sun loungers. I couldn’t’ have asked for a better room. There was even a view of the sea. My favourite part of the day was sitting in my cold private pool in the hot afternoon. In the humid, boiling heat, my private pool was shady and deliciously cool. I made it my routine to sit in my nice cold pool naked, drinking afternoon tea while reading a book or talking on the phone every afternoon between spa sessions and evening meditation class. It was my favourite part of the day, and a huge luxury, to have that precious time and space all to myself. That’s what I call Barefoot Luxury! The rooms at Kamalaya have no TV and no internet, to encourage guests to relax their minds from work and mental distractions during their retreats (paid internet is available in the guest rooms upon request and 24-hour free internet is available in the library). Even though at home I was addicted to TV and internet, I didn’t miss it at all at Kamalaya. It was a relief to come to a quiet room and read a book. It helped relax and de-clutter my mind of its usual junk and angst, and I had some amazing insights about my life while sitting in the pool and lying in bed upon waking up in the morning with a clear head. As it turned out, going alone to Kamalaya was the best thing I could have done. I needed all the rest I could get and the time alone gave me precious moments of quiet time for inner reflection. I had all the social life I needed in the dining room. Since most guests travel solo to wellness retreats, there’s a community table for people who want to socialize with other solo travellers. Flavourful sour and spicy Thai green mango salad with prawns, my favourite dish. Breakfast and dinner at the hilltop restaurant. Joining the community table every night was like going to a dinner party where you meet new, interesting people at every meal. I met a fun group of women including Lauren, an art expert at Sotheby’s in London; Ado, a European investment banker working in Bahrain; Christine from Geneva who worked for an art gallery specializing in antique Indian paintings and textiles in London, and Raymundo, a South American cattle baron who had lived all around the world and spoke 7 languages. He’d come to recover from taking care of his wife who had recently died of Alzheimer’s. I found that quite a few people were recovering from relationship breakups, or were in between a career change, and were doing the Embracing Life Change program. Others were there just there to de-stress or detox. I ate plenty of protein like this salmon and quinoa dish for much needed energy. One interesting and happy thing I found out at dinner was that half the people I talked to recognized my blog Barefoot Luxe and said they had read it while researching their travel plans. One person even quoted something I’d written that had impressed her from one of my blog articles. I often meet people who’ve read and remember my articles in a newspaper or magazine, and now increasingly, this site Barefoot Luxe. It’s always gratifying when I find out that something I wrote had a direct influence on other people’s decisions on where to go or what to do. After all, that’s one of the reasons I started this blog, and its so satisfying. Not every person at the community dinner table wanted to be chatty. My first night at dinner I sat next to a giant bear called Dirk, who had a permanent scowl and looked miserable. Dirk always frowned at me. Dirk was doing a detox for 2 weeks and was on a very restricted detox diet, which explained his bad mood. (“He’s on a diet, it makes him grumpy, poor thing.” the other girls said sympathetically). My second favourite dish, grilled salmon with spicy gotukala salad. I finally saw him smile on his last day, when his detox was over and he’d lost 3.5 kilos (yay!). He was heading home to Germany and said he’d already told his wife to start buying black bread and sauerkraut, cut out the pork sausages and potatoes, and was planning to install a Far Infra-Red Sauna in his new house. I gaped at him. Who was this person? Was this friendly Chatty Dirky the same grumpy grizzly bear Dirk who had glared at us over his mung bean risotto the other night? Whooaa! Lunch is served at the lovely beachside and poolside Amrita Café. During the retreat, everyone mentioned how they were so immersed in their activities and treatments that it was hard to tell if they felt different or if changes were taking effect. The wellness experts told us that we wouldn’t feel the effects until after the retreat when we got home and realized how different we felt. I was no exception. During my week at Kamalaya, I was living in the moment. When I got home I knew I felt completely different from when I had arrived there stressed, worn out, emotionally and mentally exhausted. I woke up at home the next day feeling fresh, lighter in body and mind, and most noticeably, very, very calm. Things that would have set me off in a rage a week earlier didn’t faze me at all. I was amazed at my own transformation. I hadn’t even done any emotional therapies during my retreat, wanting to focus on my physical state, but the holistic effects were there all the same. The upper lounge is where we sometimes liked to, drink tea and chat after dinner. Solo time leads to plenty of deep sleep. I got as much sleep as I wanted. No internet, no work, no everyday household worries – total mental rest! Did I really have to go away to a retreat to achieve these lifestyle changes? For me the answer was yes. I’d never have been able to do all these things while carrying on my normal life at home. After meditation class, the world is a more beautiful and wonderful place. It makes you wanna kiss someone! A week of completely healthy eating and new, whole food, energy boosting healthy food routine with no carbs or junk food that I could maintain back home. At the follow-up wellness consultation I found that my weight hadn’t changed, (no surprise there, since I couldn’t resist the fabulous cheese soufflés on the menu). Wellness consultant Deidre said I still looked as exhausted as I had when I first arrived. That surprised me, since I felt much better already. But I knew that Deidre didn’t mean to insult me but to say that my work wasn’t done and I needed more work to get back to my full health. She suggested that I try a different program if I came back again, because judging from what I’d told her, I still needed to work on how to manage the other stressful parts of my life, not just the fitness. Seventy percent of the bookings at Kamalaya are repeat guest, so don’t be surprised if you hear that I’m back at Kamalaya again in the not so distant future. I passed Lauren having a morning swim on my way to my training session in the gym. I stayed in touch with the interesting new friends I’d made at Kamalaya. Lauren messaged me from London and Ado messaged me from Bahrain in the following week. Ado was back in her investment banking office, missed Kamalaya and her new friends, and was trying to stay with her new “flow”. Yes Ado, I feel my aura is lighter too. I think we all do after returning from an all-around wellness immersion at Kamalaya. BOOK YOUR STAY – See all their latest packages, best prices guaranteed, advice on planning & travel, and book online here for Basic Optimal Fitness Program or Comprehensive Optimal Fitness Program. Have a look at Kamalaya’s other wellness, de-stress, detox and wellness programs and prices and book here. Have you been to Kamalaya Koh Samui? How was your experience there?